Tablets have quickly emerged as a distinct third digital screen in consumers lives that fill the gap between desktops and smartphones. But there are still many open questions about exactly how consumers are using them. We explored tablet search trends earlier this year, but wanted to dig deeper and answer key questions such as: What are the contrasts between tablet use, laptop use, and smartphone use and how are consumers engaging across these devices? What are the most common activities (playing games, searching, reading, etc.) that tablets are used for? What ads are most relevant and useful based on how people are using the devices? One of our studies, a diary study that had people record every occasion that they used their tablet over a two-week period, found that most consumers use their tablets for fun, entertainment and relaxation while they use their desktop computer or laptop for work. Tablet devices are personal - 91% of the time that people spend on their tablet devices is for personal rather than work related activities. When a consumer gets a tablet, we’ve found that they quickly migrate many of their entertainment activities from laptops and smartphones to this new device. Tablet owners are building the device into their daily routine. 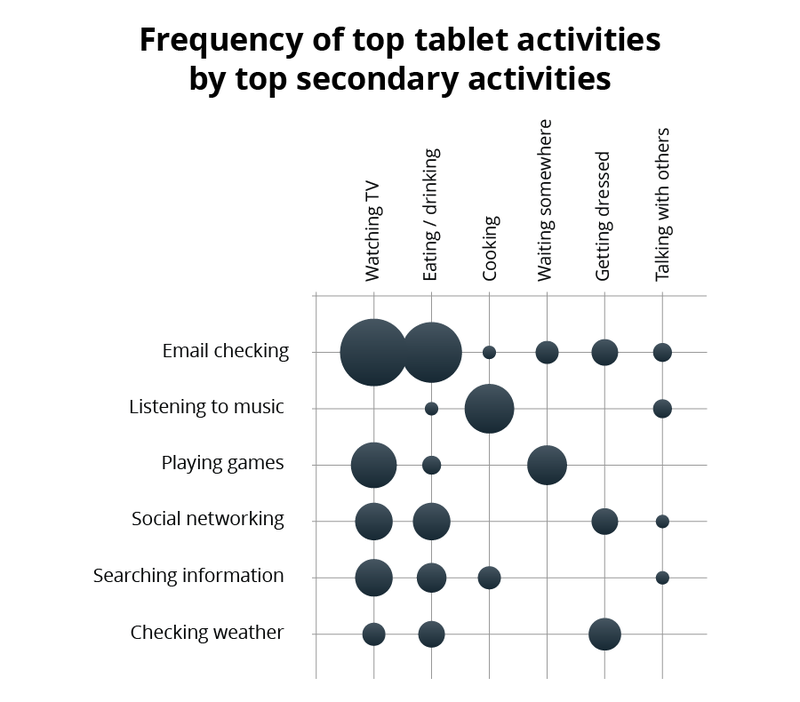 Our research found that the most frequent tablet activities are checking email, playing games and social networking. We also found that people are doing more activities in shorter bursts on weekdays (e.g. social networking, email) while engaging in longer usage sessions on weekends (e.g. watching videos/TV/movies). Tablets are multi-tasking devices with at least 42% of activities occurring while doing another task or engaging with another entertainment medium. Of all the activities that people do on tablets, checking email, playing games, social networking and searching are the ones most frequently done in front of the TV. Many consumers also used their tablets to check email while eating, and listen to music while cooking. The activities shown in the above chart were self-reported by respondents. But unlike smartphones that go everywhere and laptops that travel between work and home, few consumers take their tablets with them when they leave the house. However, consumers do take their tablets on vacation or work trips where they use them as a laptop replacement and a small number take them on their commute. Interestingly, our recent research found that tablets are for the most part a one-person device, although there are consumers who share their tablet with other family or household members. Tablets are, however, mobile within the home, with the highest usage taking place on the couch, from the bed and in the kitchen. The activities and locations shown in the above chart were self-reported by respondents. Many consumers do a lot of window shopping on their tablet and our data shows that they are making more and more purchases on their tablet devices. Indeed, tablets figure to be a significant new way for people to be shopping this holiday season. While shopping they are engaging with familiar brands through social media sites, deals discounts, and navigating directly to trusted shopping sites. We also found that people are using their tablets for activities that they are also doing in the real world, such as searching for something in their local area, shopping (browsing and purchasing), and managing finances. For many people, websites and apps designed for smartphones just don’t cut it on tablets. Instead consumers are taking advantage of the bigger screen and prefer using fully featured apps and the full desktop sites on their tablet. We found that some of those activities also extend to additional devices (e.g. smartphone, laptop, etc.). These activities included shopping (both browsing and purchasing), searching for information, managing finances, checking the calendar and checking email. Consumers are engaging with useful, relevant and rich ads that take advantage of the touchscreen interface on tablets. Some consumers expect more interactivity from ads on tablets than they do from ads on their desktop computer. We believe that tablet ownership will continue to rapidly grow in 2012 and that tablet usage may change over time, particularly as smaller devices come on the market. We plan on continuing to conduct research to understand consumers’ uses of their tablet devices and are excited to share these research insights with you.